Well ComPODres, with 26 episodes in the can, the Comadres are calling it a wrap on Season 1 of Comadreando! Not to worry, we'll be back soon for a new and improved Season 2. In the meantime, find us on Facebook Twitter, and Instragram at @comadreandocast to let us know what your favorite Season 1 episode was and which one of our many BFFs you'd want to befriend! We're also on the prowl for new topics to tackle come Season 2, so leave a post/ comment with your ideas for which new BFFs we should hang out with and/or what new worlds and situations we should expore. Remember- ANYTHING is possible, and EVERYONE is your best friend. Thanks for tuning in for Season 1 and stay tuned fore more to come next season! - Allisantos, Susie, & Abril. Art imitates life like no other when it comes to Teen Movie tropes. 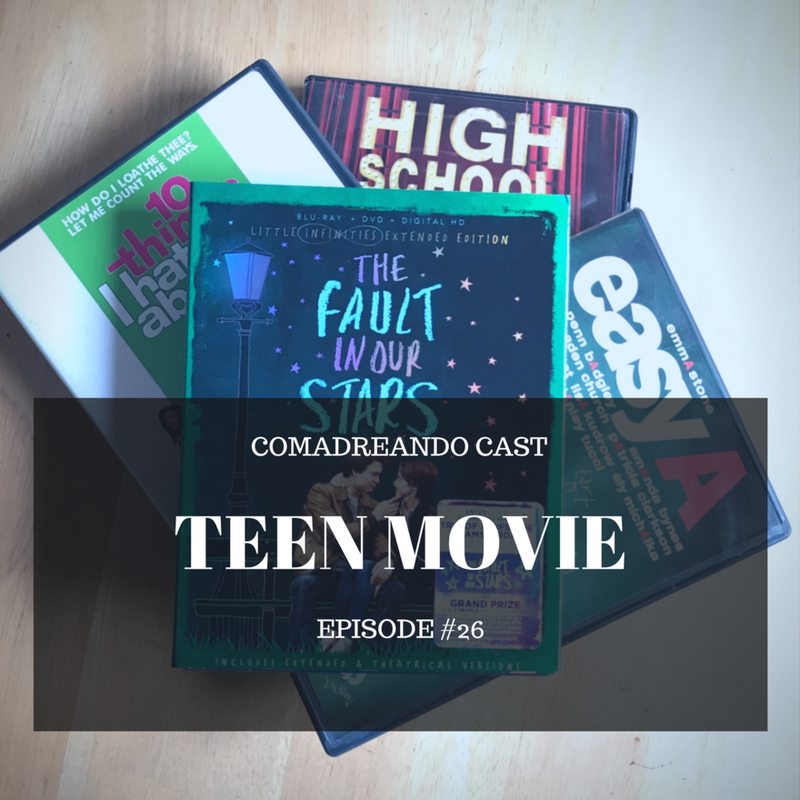 In this episode, the Comadres discuss which Teen Movie high school they'd attend, the cliques they'd roll with, and who their BFFs would be. Susie creates a different fairy-tale ending for a modern Shakespeare adaptation, Allisantos shakes up the status quo of a musically-inclined student body, and Abril colludes with her BFF to turn the rumor mill into a money maker. If you could attend high school in any Teen Movie, which movie would you choose and why? Find us on Facebook, Twitter, and Instagram at @comadreandocast to let us know! "Favored by the Gods" takes on a whole new meaning if they are literally your BFFs. In this episode, the Comadres discuss the never-ending drama that is Greco-Roman mythology and decide which Greek/Roman God or Goddess they'd befriend admidst it all. Allisantos goes joy-riding across the sky with a multi-faceted god, Susie spends time helping the mother of all drama queens forget her troubles, and Abril gets fired up with an Olympian underdog/ ultimate come-back kid. If you could be BFFs with any Greek God or Goddess, who would it be and why? Find us on Facebook, Twitter, and Instagram at @comadreandocast to let us know! Few things go together like coffee and conversation. In this episode, the Comadres describe the conversations they'd have over a coffee date with the historical figures of their choice. Susie shares a cafecito and discusses beauty, pain, and creativity with a celebrated artist and feminist; Abril savors a cappuccino and discusses the art of science and the science of art with an intellectual powerhouse who straddled both fields; and Allisantos brews up some potent chai to discuss personal transformation and political reform with a wild child turned peaceful revolutionary. If you could sit down for a coffee date with any historical figure, who would it be and what would you talk about? Find us on Facebook, Twitter, and Instagram at @comadreandocast to let us know! Everyone knows that it takes the right team to get the job done right. 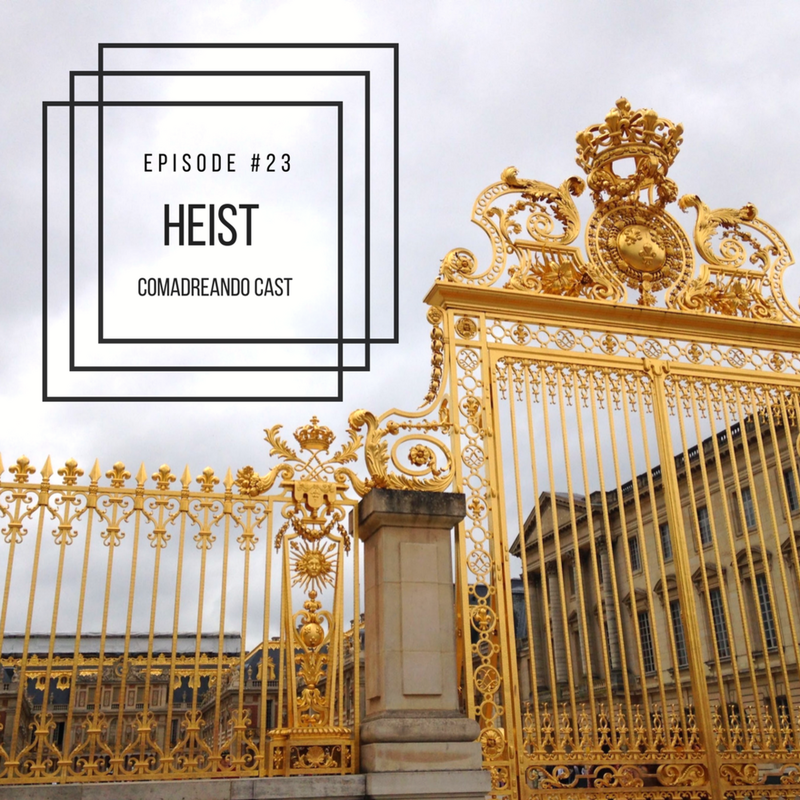 In this episode, the Comadres discuss the ultimate heist: the members of their teams, the roles they each play, and the targets they plan to steal. Abril assembles an unlikely assortment of experts who can pull off any job that comes their way, Susie decides to go robin-hooding with a hilarious duo in possession of the ultimate get-away vehicle, and Allisantos plugs in to support a notorious crew in pulling off one of the biggest heists of all time. If you were to plot a heist, who would be on your crew and what would be the target? Find us on Facebook, Twitter, and Instagram at @comadreandocast to let us know! Dinner is served! 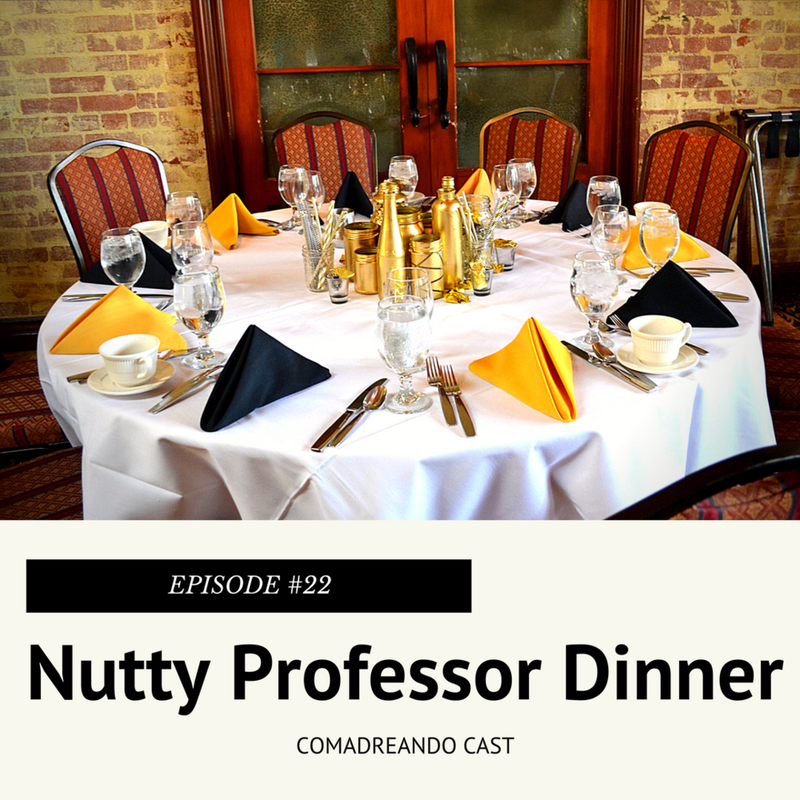 In this episode, the Comadres plan a dinner party for their actor BFFs and discuss which of their most famous roles/ characters make the guest list! Susie and Abril must deal with conflicting party dates and overlapping guest lists when they choose the same beloved and versatile Oscar winner, while Allisantos's dinner quickly morphs into a rowdy pool party featuring the many incarnations of a beefy action/ comedy star. If you could host a Nutty Professor-esque dinner for all of the characters portrayed by your actor BFF, who would you invite? Find us on Facebook, Twitter, and Instagram at @comadreandocast to let us know! There are Good Cops, there are Bad Cops, and then there are Buddy Cops. In this episode, the Comadress discuss their Law Enforcement Agent BFFs and what that Buddy Cop dynamic would be like with their partners on the force. Allisantos chases down mallrats with the help of a fabulous, fashion-forward crooner; Susie goes deep undercover to join her muscle-head BFF's unit, where her youthful looks are a major advantage; and Abril learns to see the world in subtle shades of grey from a resident BAMF on the NYPD. If you could be BFFs with any Law Enforcement Agent, who would you choose to be your Buddy Cop? Find us on Facebook, Twitter and Instagram at @comadreandocast to let us know! Grab your passport, because THE RACE IS ON! In this episode, the Comadres discuss which BFF they would tap to join them on an international adventure as contestants on the reality TV show, The Amazing Race, and the specific skills/ talents that their BFFs bring to the table. Abril teams up with a long-time hero who can handle anything that the pursuit of fortune and glory throws their way, Susie chooses a musical-loving action hero with a Hufflepuff heart, and Allisantos goes for a brilliant, linguistically gifted queen of the silver screen. If you were to compete on The Amazing Race, which BFF would you tap to be your teammate? Find us on Facebook, Twitter and Instagram at @comadreandocast to let us know! The only thing better than swapping hilarious YouTube links with your BFFs is swapping hilarious YouTube links FEATURING your BFFs. In this episode, the Comadres go channel surfing on the interwebs and decide which YouTube personality they'd befriend and how they'd plug into the viral video action. Allisantos pairs off with a veteran Disney music whiz and his gang of famous, talented, and famously talented guests; Susie, who is no stranger to the 'tube, faces an agonizing "Sophie's Choice" scenario over which of her beloved YouTubers she will single out as her BFF; and Abril, after being thoroughly overwhelmed by expansive nature of the YouTube universe, decides to go with a hilariously cocky guy whose mission is to expand his own and his friends' horizons. If you could be BFFs with any YouTube personality, who would it be and why? Find us on Facebook, Twitter, and Intstagram at @comadreandocast to let us know! We've all secretly wanted to be adopted by our BFF's family. In this episode, the Comadres consider which fictional family they would want to be adopted by and how they would fit in to their adoptive family's dynamic. Abril and Susie end up joining the same unconventional clan and hanging out together at family reunions while Allisantos opts to join a tight-knit family to help alleviate the stress of dealing with an annoying next-door neighbor. If you were to be adopted by any fictional family, which family would it be and why? Find us on facebook, Twitter, and Instagram at @comadreandocast to let us know! We have all, at some point, longed to run away from our own realities and disappear into a world where our favorite stories and characters are real. In this episode, the Comadres discuss the fictional worlds they would love to be a part of and which characters they'd be BFFs with once there. Allisantos seeks out a new BFF at an exclusive academy staffed by long-time heroes, while Abril and Susie find themselves running around the same world, but in different social circles and on separate, yet overlapping timelines. If you could inhabit any fictional world, which one would you choose and who would be your BFF there? Find us on facebook, Twitter, and Instagram at @comadreandocast to let us know! Nothing beats hitting the open road with your BFF riding shotgun. In this episode, the Comadres consider which BFF they'd go on a road trip with and where they'd go. Allisantos takes off on a tour bus packed with talent, Abril zooms across Europe with an enthusiastic expert, and Susie heads south of the border with a BFF from the north. If you could go on a road trip with anyone, who would you roll out with and where would you go? Find us on facebook, Twitter, and Instagram at @comadreandocast to let us know! Forever is a very long time, but what better way to pass the centuries than with a Vampire BFF? In this episode, the Comadres consider which Vampire BFF they would be willing to roll with for eternity. Susie joins a mystery-solving crew in the City of Angels, Abril drops in to visit her vampire BFF and his roommates every hundred years or so, and Allisantos goes drag-racing with the patriarch of an unconventional modern family. If you were going to be turned by a vampire, which vampire would you want to roll with for eternity? Find us on facebook, Twitter, and Instagram at @comadreandocast to let us know! Being BFFs with a Monster is not for the feint of heart, considering the fangs and fur and slime and claws involved. However, just because they have the capacity to scare the bejeebus out of us doesn't mean they can't be our BFFs. In this episode, the Comadres discuss the Monsters they love in spite of and even because of their scariness. While Allisantos has been tearing up dance floors with an old college buddy for years, Abril bemoans not having met her BFF earlier in life and Susie sips picklebacks with her BFF in his native Brazil. If you could be BFFs with any Monster, which one would it be and why? Find us on facebook, Twitter, and Instagram at @comadreandocast to let us know! It is a truth universally acknowledged that siblings hate having to share stuff. However, when it comes to the Comadres, these siblings wouldn't necessarily mind sharing a BFF. In this episode, the Comadres discuss which sets of siblings they'd befriend; rivalries be damned. Susie lets her nerd flag fly with the powerful co-rulers of a vast media empire and Allisantos hangs out with a family of child stars turned low-key adult celebrities while Abril struggles to not laugh every time her BFFs walk into a bar together. If you could be BFFs with any set of siblings, which siblings would you befirend and why? Find us on facebook, Twitter, and Instagram at @comadreandocast to let us know!